Unless you’re someone who just came to Spider-Man over the past two or three years, the phrase “Brand New Day” probably prompted some kind of emotional reaction for you (though, maybe not as visceral of a reaction as my regular reminders of another dark period in Spider-Man history). That’s because “Brand New Day” was Marvel’s clever branding of the series of storylines that followed the universally reviled “One More Day” arc – aka, that storyline where Peter Parker made a deal with the devil and dissolved his marriage to Mary Jane. But I’m not here to focus on the negative. Seriously, I’m not! In fact, one of the reasons why I want to dedicate some virtual ink to “Brand New Day” is because I think some readers have had an incredibly hard time disconnecting these stories from the editorially mandated disaster that preceded it, meaning a bunch of quality, well-written/illustrated comics have been forgotten about despite the fact that they are less than 10 years old. 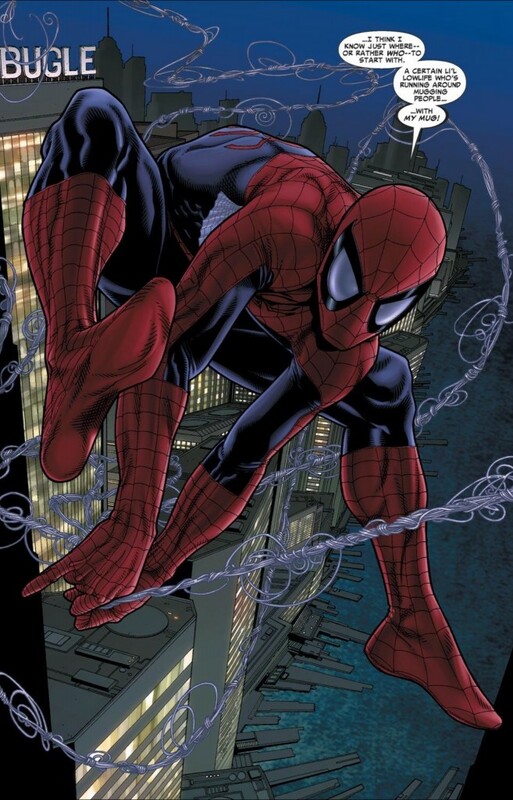 “Brand New Day” ushered in a period of high-octane creativity for Amazing Spider-Man, with three issues being published a month (thanks in large part to the dedication/efficiency of editor Stephen Wacker, who left DC after editing the company’s weekly 52 series) and different creative teams rotating on and off the books. Fans who love current Spidey scribe Dan Slott should note that he got his start with Amazing Spider-Man during “Brand New Day” (in fact, he scripts the three issues, ASM #546-548, I’m going to talk about here), while other top-notch creators like Mark Waid, Fred Van Lente and Joe Kelley also contributed some terrific stories. So for the next month or two, I’m going to sequentially profile each arc in “Brand New Day,” which for those keeping score at home means Amazing Spider-Man issues #546-564 (aka, all of the issues that say “Brand New Day” on the front cover). If I find myself really engrossed (and if I get a sense that you guys like it too), I’m going to carry on with my retrospectices of these issues until I ultimately grow tired of the exercise. 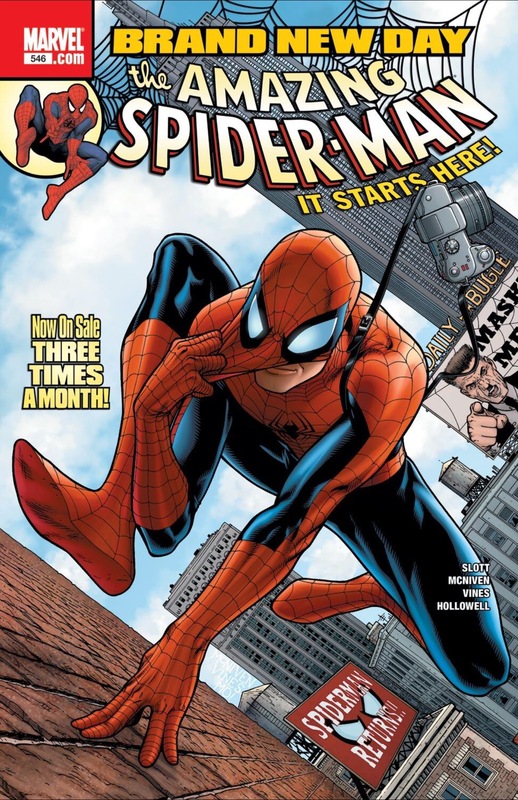 Keep in mind, I have covered a few stories from the era immediately following “Brand New Day,” such as “New Ways to Die,” and “Unscheduled Stop,” but as a whole, I’ve avoided talking about this era of Spider-Man, which leaves a bit of gap of content on my site which I’d like to remedy retroactively. As I’ve been indicating through these first few paragraphs, “Brand New Day’s” opening arc is a ridiculous amount of fun, and does a fantastic job of establishing the new Spider-Man status quo in a way that doesn’t feel overly heavy-handed (except in a few spots, which I will get to). It’s plainly obvious that this is an early Slott Spider-Man story (he did script the excellent Spider-Man/Human Torch miniseries but beyond that, his experience with Spidey was mostly the Wall Crawler’s guest appearances in other books he was writing), as there’s a certain amount of “feeling out” going on in terms of some of the trademark silliness and irreverence which tend to dominate his writing of the character today (sometimes to a fault). But in the case of “Brand New Day” and ASM #546-548, the freshness of Slott works hand-in-hand with the dramatic reboot of the character and his universe. Even before Marvel’s former editor-in-chief Joe Quesada interfered with J. Michael Straczynski’s run on ASM, I felt that the book and the character was getting a bit stale and tired, especially as it jumped from one event (Civil War) to the next (“Back in Black”). JMS seemed to be losing track of who this character was and while I know Straczynski loves to blame all of his bad stories on editorial interference, he does have to take some responsibility for how the second half of his run is regarded. “Brand New Day’s” opening arc tries not to dwell too much on how the JMS run ingloriously ended, though there is a little bit of needling to fans who were outraged about the dissolution of Peter and MJ’s wedding (but still reading the comic obviously). The very first page of ASM #546 opens with Peter making out with a girl who is very clearly not Mary Jane. And a little later in the storyline, he even chides Harry Osborn (who returned from the dead without any fanfare – what?) about being too young to be married. Yes, these scenes were undoubtedly inserted into the comics to tell those fans still holding out that “One More Day” will be reversed to essentially get over it. But the way Slott scripts these sequences makes it come across like a bouncer denying you access to a club with a big, beaming smile. He feels your pain man, but this is the way it is, ok? I’m not going to lie; I loved how this is executed. 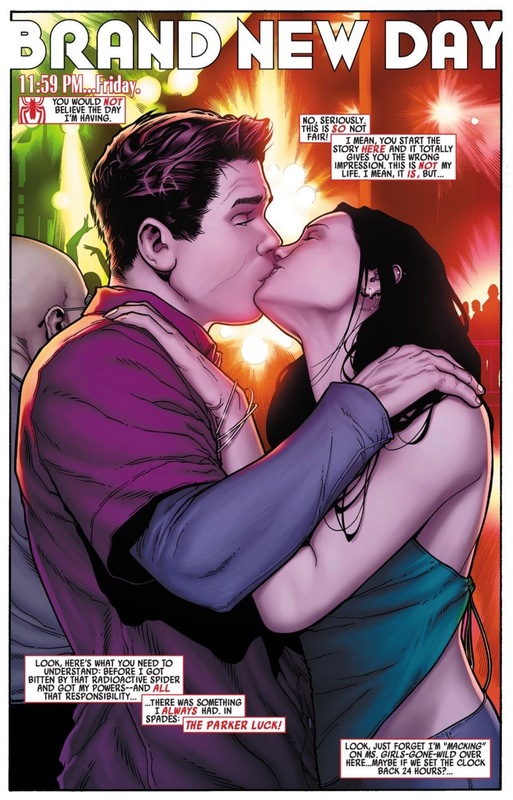 I have said in previous posts that from a strictly pragmatic perspective, I totally understand why Marvel wanted to find a way to unmarry Peter. The entire Peter/Mary Jane marriage was just another sales-driven event from then Marvel EIC Jim Shooter. Fortunately, some very worthwhile writers like J.M. DeMatteis and David Michelinie were able to take this awkwardly shoehorned plot development and transform it into something that helped shine new insights on the Spider-Man universe. But having a married superhero was also undoubtedly limiting in terms of the range of stories Marvel was able to tell with Spider-Man. Slott also uses this opening arc to develop a whole new supporting cast, including potential allies/love interests like Carlie Cooper (who, contrary to what some fans think, I thought was a fun character in the series until she was suddenly written like a total moron during Superior Spider-Man) and a new supervillain, Mister Negative (probably my favorite bad guy introduced during “Brand New Day”). Typical of Slott, he plants so many seeds over the course of this three issues, weaving different subplots together like a maniac. It lends an almost manic level of energy to the series, but also feels totally appropriate given just how much groundwork needed to be laid down at “Brand New Day’s” onset. We get a side story about J. Jonah Jameson losing control of the Daily Bugle, and Aunt May working in a soup kitchen/homeless shelter (which in turn connects to Mister Negative). There’s also a mugger going around dressed as Spider-Man, which in turn leads to an ongoing storyline about Spidey being framed for murder when one of his tracers is found inside a dead body. But above all, this storyline really plays up Peter’s youthful elements as a character. There’s an emphasis on the “Parker Luck” of which we really haven’t seen since the Stan Lee/Steve Ditko era of ASM. Keep in mind that this characterization is a dual-edged sword for me. I love how it’s a throwback to what is arguably the golden era of the character, but over the years, I also feel like many creators (including Slott) have overplayed Peter’s misfortune to the point that he comes across almost buffoonish rather than unlucky. But in terms of this specific storyline, it’s definitely more the latter rather than former, especially when he ends up having to give up a blood sample to Negative (who uses it to blackmail Spidey by telling him he will use it to make a potion that will kill him and his family if he ever meddles in his business again) in order to save the lives of Maggia Family children. Again, at no point over the span of these three issues did I find myself thinking, “this story needs Mary Jane,” or “this story would be enhanced if Peter was married/had kids.” “Brand New Day” was proof that with the right creators on the title, great stories could be told about Peter regardless of his marital status. But could that momentum be maintained? We’ll have to see next week when Marc Guggenheim jumps on the book and introduces us to the new villain, Menace. Big fan of Brand New Day, some of the best comics ASM has seen since the heyday of Stern/Romita Jr back in the 80s. As bad as OMD was, we came out the other side with a sense of fun the book hadn’t seen in forever, after years of dismal event tie-ins and angsty melodrama. One of the biggest successes was the revitalization of the supporting cast. I enjoy JMS/JRJR Spidey as much as the next guy, but it was pretty much just Aunt May and MJ as far as cast members go. BND brought Harry back as Peter’s best friend, a cruical element the book missed for decades, and he got his own story arc over the course of the book, from the drama with his girlfriend, to opening the Coffee Bean, to finally getting out of his abusive father’s shadow, to escaping with his new son to be the father he couldn’t be to Normie and Norman wasn’t to him. Aunt May being positioned at the Care center got her more involved in the action(like how Peter being at the Daily Bugle gave him an excuse to get involved in crazy stuff happening in NYC, which was the biggest weakness of the School Teacher phase JMS wrote), and I love EVIL AUNT MAY and how they built to MayxJonah Sr. Speaking of Jonah Sr, he’s the kind of cast member I’m shocked they hadn’t done earlier, he’s great. And having Jonah lose the Bugle and become mayor of NY was a great shake-up of the status quo, while still giving Jonah that authortive position to make Peter/Spidey’s life crazy. I also rather liked the new “love interests” like Carlie and Norah, I thought they were fun additions. And the artists! You talk about great creators like Slott, Van Lente, and Waid and I agree, but when I think about BND I think about how it was one of the best, most unique lookin’ book either Marvel or DC was putting out, and it the flagship solo ongoing! McNiven, Jimenez, Romita Jr, Marcos Martin, Paolo Rivera, Emma Rios, Chris Bachalo, Eric Canete, Joe Fiamura, Javier Pulido…just fantastic. Kudos to Steve Wacker’s art choices and his ability to keep the book coming out 3x a month. The only big problem was it was very inconsistent with the swapping creative teams. They all had their favorite pet characters they’d use exclusively(Joe Kelly with Norah, Slott with Carlie) and often didn’t pick up on each other plot threads. There’s a good portion in the middle(of some VERY solid Spidey stories) that you could mix around in any order and you wouldn’t miss anything. And as good as Slott, Waid, Van Lente, Wells, and sometimes Kelly was, Gale and Guggenhiem stunk and I never wanted to read their stories. You have stretches where the book was wack, and then other stretches where you couldn’t wait to get the next issue in a couple weeks. There are more hits than misses, tho. Rather liked this first story. Slott’s got a great voice for the characters, like a modern Stan Lee I think in his style of compressed, excitable writing. Like you said, he sets up some interesting plot threads and character relationships, most importantly being Mr. Negative and his army. 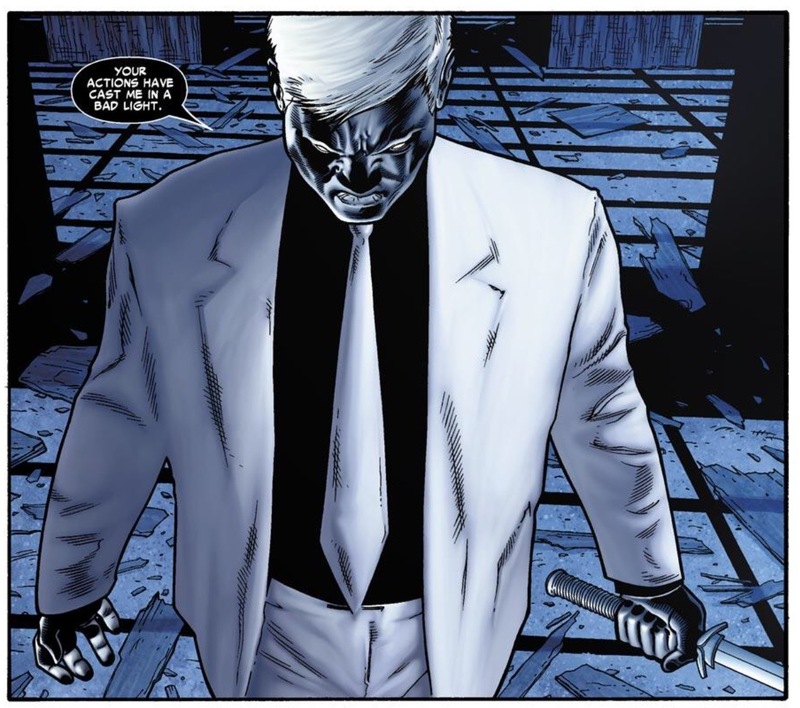 Not only are they a great visual, but they give Spider-Man a Kingpin like character he can’t arrest/defeat so easily, since Wilson Fisk kinda moved over to being a Daredevil character. Slott takes about a 100 issues for that blood vial/Mr. Negative thing to hit its conclusion, and its very sastfying when it does. And McNiven acquits himself well. It’s a good lookin’, realistic style to reel readers in before Wacker puts the more visually distinctive artists like Bachalo, Ro mita, and Marcos Martin on the book. Love the circus finale, where in a meta way Spidey’s antics entertain the audience much as it entertains the reader. Good opening story arc! Kinda thing that makes you wonder why the book wasn’t more like this years ago. Hope you keep this series going, I’m gonna try to comment on each one, for better and for worse. It’s worth noting that, whatever one’s opinion of OMD or the last half of JMS’s run happens to be, BND was a seismic shift in the book, not only in direction but also in tone. Even prior to the Civil War nonsense, JMS’s Peter Parker was somber and philosophical, balanced out by a flair for mischief and irreverence. The stories followed Pete’s POV almost exclusively, with an occasional aside to show what May or MJ or the villains of the piece were up to. And then comes BND, which is throwing so much stuff at the reader so quickly that it’s almost overwhelming by comparison. The tone is completely different, Peter’s personality has shifted in the opposite direction, and there’s a dozen different characters dancing in and out of the arcs. By the time you get to the Gauntlet, the team is firing on all cylinders, but even with the gift of distance, I do think the first few months of BND were a bit rocky. This initial arc, however, is pretty great. Rather liked this first story. Slott’s got a great voice for the characters, like a modern Stan Lee I think in his style of compressed, excitable writing. Like you said, as the first up to bat Slott sets up some interesting plot threads and character relationships, most importantly being Mr. Negative and his army. Not only are they a great visual, but they give Spider-Man a Kingpin like character he can’t arrest/defeat so easily, which he hadn’t had since Wilson Fisk kinda moved over to being a Daredevil character. Slott takes about a 100 issues for that blood vial/Mr. Negative thing to hit its conclusion, and its very sastfying when it does. And McNiven acquits himself well. It’s a good lookin’, realistic style to reel readers in before Wacker puts the more visually distinctive artists like Bachalo, Romita, and Marcos Martin on the book. I loved “Brand New Day”. I am not sure where it hits it’s creative niche, but the first few issues, including the Slott issues you are discussing here. were rough. Like, they did an excellent job at weaving and passing along subplots to another writer, but they really portrayed Peter as this slightly buffoonish guy, which is weird after the past 20 years of “more mature married” Peter. I’ve been following your posts for quite some time now even though I don’t read the Spiderman books anymore (disclaimer). I like to read your informed and insightful opinion and keep up with my favorite childhood superhero–I am tempted to start picking up the book again or some of its satellite books. That’s a compliment to your inspired and passionate writing of the character and its franchise. I have to say that I disagree with your apology of OMD/BND, however. The notion that the marital status determines the range of stories is I think untenable. If a creative team could be put together to craft a number of vibrant stories with single Spiderman, then surely a similar team could be hired to craft equally engaging and entertaining stories with a married superhero. I sometimes feel it’s a matter of will: the company does not have the will to allow their product to age, to mature, to grow. Thus they keep Peter Parker like Peter Pan forever young, forever infantile. Perhaps someone crunched some numbers and decided there was more money in single, adolescent Peter Parker/Spiderman than an adult version. I had hoped that when they launched Ultimate Spiderman that this series would follow Peter Parker into adulthood while the ASM series remained under the glamor of Perpetual Youth. In other words a way to have your spider cake and eat it too. Obviously these decisions are difficult, balancing the monetary aspects with the growth of the comic book media as a recognized art form. But such decisions like OMD/BND in my opinion only perpetuates the notion that comic books are juvenile fare, picture books for the (stubborn) child in us all not graphic art for mature, educated adults. And this is a shame since the books are generally sophisticated in tone, in approach, and in their art, especially their art (based on your reviews admittedly). I may not grasp the actual nature of the business-side of Spiderman (superhero) comic books in thinking that they can also be elevated to an artistic art form (lipstick on a pig), but as someone who grew up adoring the character and his adventures, watching him for a brief time keep pace with my own life, I had hopes that the Character and the Story would some day have one definitive telling not in place of, but alongside the other (some great, some not so great) stories and versions, one that seemed to include marriage and the possibility of children. I felt the character deserved that much. In any event, I enjoy your posts very much! And will continue to follow them as you track the adventures and annotate the history of our favorite wall-crawler. Thank you. I agree with a lot of the comments here. Brand New Day was a burst of creativity and energy when the title really needed it. Like any run there are high and low points but in general I look back on it fondly. The stand outs for me were the infusion of new villains and supporting cast. Both of these gave the title the feeling that it wasn’t retreading history but trying to blaze it’s own path. I didn’t care for BND. It felt like a step back to me. The new characters/villains all seemed like rehashes of old characters and the stories were entertaining but bland. 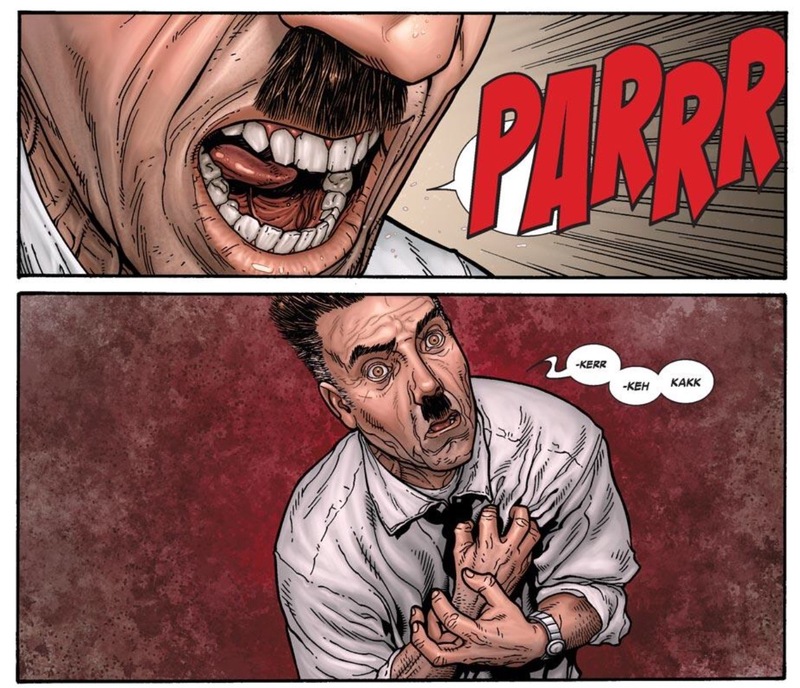 Also, I really hate the BND Peter Parker. JMS’s take on Pete was so much better IMO. I actually stopped reading Spider-Man shortly after BND started and only came back for Superior Spider-Man because that seemed to be doing something different. I’m not sure how much longer I’ll pick up this current run of Amazing. I kind of hated Carlie because she came after MJ but when Carlie got her Spider-Man tattoo I kind of liked her. Her Superior Spider-Man arc was a waste. I, too, felt that “’Brand New Day’ was proof that with the right creators on the title, great stories could be told about Peter regardless of his marital status”. Which is what really bothers me. At NO POINT in this story did I feel like “this story would be enhanced if Peter *wasn’t* married/had kids”. Sure, there was the kissing scene that you mentioned, but that was a minor thing and almost felt like a slap in the face to readers showing them that no, OMD wasn’t just a bad dream. To me, the writers of BND needed to justify to me that the huge change that was done (making Peter single) was NECESSARY. In other words, post-OMD (BND) needs to justify what came before. You seem to be saying the exact opposite and that feels very backwards. If Marvel is going to do a major change to a character, they need to justify that that CHANGE was necessary. So, I need to be convinced that Peter being single is necessary, not that being married is unnecessary (if that makes sense?). I just never got that feeling from the majority of BND (or Big Time or anything that has come since, in all honesty).